Downer, who studies wild horses, outlined his views in an open letter to board members ahead of an advisory board meeting this week. Downer is a high-profile advocate for wild horses and burros, having written a book, The Wild Horse Conspiracy, and authored various scientific and popular articles on these animals. “My number one recommendation is that you cease being manipulated by the selfish interests who have for so long and continue to attack the wild horses/burros, not because of legitimate concerns, but primarily because of their unwillingness to share the land and freedom with these amazing animals,” Downer said in his letter. “I would like you to recognize that these same interests ‘put the squeeze’ on the wild horses/burros, setting them up for difficult circumstances, and then hypocritically come around to say they are concerned about the wild horses/burros. Downer said it was reprehensible and deceitful for interests to continually accuse the wild horses and wild burros of being overpopulated, when objectively they were underpopulated in terms of their genetic levels and portion of resources consumed when compared to livestock, mining, and other exploiters of the public lands. Her urged board members to take the core intent of the Wild Free-Roaming Horses and Burros Act to heart. He further urged board members to recognize the many positive contributions that wild horses and wild burros can and do make in many natural ecosystems where they have a legitimate niche to fill and role to play. He implored members to reject the “killing” option that the board had earlier voted to approve in September last year in Elko, Nevada. 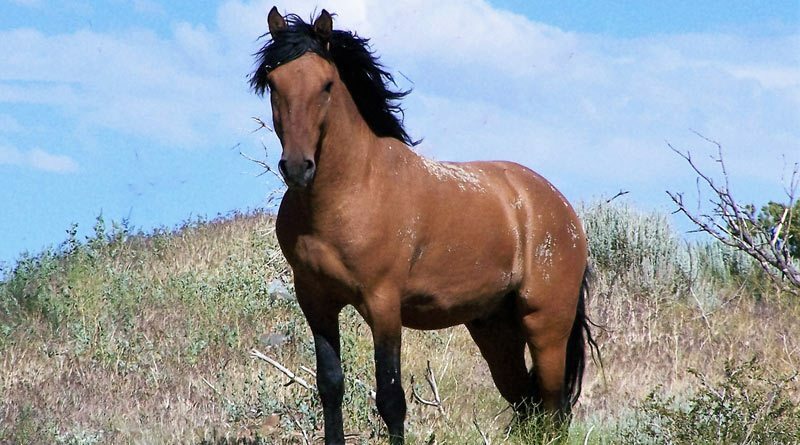 “This would be horribly cruel and insensitive and entirely unnecessary and unwise, given the many benign roles that wild horses and burros can play and contributions they can make to the public lands and other ecosystems in our great nation,” he said. I greatly appreciate this opportunity to give input on our nation’s wild horse and wild burro protection program and hope that you will give serious consideration to what I have to offer, which includes several attachments including of my ongoing Reserve Design and Ecological Evaluation work in several wild horse legal areas, as well as a poem about a horse that I hope you enjoy. My number one recommendation is that you cease being manipulated by the selfish interests who have for so long and continue to attack the wild horses/burros, not because of legitimate concerns, but primarily because of their unwillingness to share the land and freedom with these amazing animals. I would like you to recognize that these same interests “put the squeeze” on the wild horses/burros, setting them up for difficult circumstances, and then hypocritically come around to say they are concerned about the wild horses/burros. But what they fail to mention is that they themselves are the ones who put these innocent animals in the difficult situation to begin with, because of their unwillingness to fairly share the public lands resources, including forage, water, space, shelter, and all the other factors that go together to make a viable habitat for a viable population in the long-term. This is basically dishonest and ill-willed, however disguised! To continually accuse the wild horses and wild burros of being overpopulated, when objectively they are underpopulated in terms of their genetic levels and portion of resources consumed vis-a-vis livestock, mining, and other exploiters of the public lands, is reprehensible and deceitful. Also to ignore the chief causes of ecological degradation, while “conveniently” laying the blame on the wild horses/burros wherever they occur, is likewise disgusting! I am therefore urging you as overseers of the wild horse and burro program to get this very important program back on track by truly fending for the rights of the wild horses and wild burros to adequate land, water, forage, shelter, seasonal migratory habitats, etc., so that these animals can be restored, not further undermined. Basically, I am asking you to give input in the character of asking the public lands livestock ranchers, mining companies, rural communities, hunting establishment, etc., to really share a greater portion of the public lands and their resources so that these animals can make a comeback, and not continue to be whittled away to dysfunctional populations that are non-viable in the long-term. As I have in prior years to this board, I am urging that you take the core intent of the Wild Free-Roaming Horses and Burros Act (WFHBA) to heart. This is about the wild horses’/burros’ right to live freely in the world of nature, and to thrive therein on their legitimate public lands. Please become upholders of WFHBA’s Section 2 (c) that defines the wild equid’s legal areas as determined by where they were found on a year-round basis in 1971 as “the amount of land necessary to sustain an existing herd or herds of wild free-roaming horses and burros … and which is devoted principally but not necessarily exclusively to their welfare in keeping with the multiple-use-management concept for the public lands.” This does not mean giving only a token forage grazing allotment to the wild horses and burros within their legal areas, as is currently the case in virtually all of the couple hundred or so areas where the wild horses and burros are still being allowed to live according to the BLM/USFS resource management plans. And this is not to mention all the many millions of acres where the wild horses and wild burros have been shamelessly “zeroed out” within their own legal territories! When the resource management plans are examined carefully, they almost invariably reveal a “short shrift” treatment of the wild horses/burros in favor of the large monopolies on the public lands, particularly ranchers, but also mining and energy extraction companies, big game hunters, and land developers. How seldom, for example, are the enormous amounts of water that are drained off the public lands by humans for extravagant and often unnecessary activities adequately recognized, and how these very adversely affect not only the wild horses and burros, but all of the species living in what remains of the natural ecosystems. Here comes to mind extravagant sprinkler irrigation of alfalfa fields (couldn’t we do drip irrigation, instead? ), lavish golf courses, or extravagant ponds around the public lands ranchers’ headquarters, which I have noticed in my overflights of the wild horse/burro legal areas. These are seldom questioned, yet such activities are putting a real squeeze, not only on the wild equids but on all the species that go together make viable wildland ecosystems tick. All these species interdepend, and often in ways that are subtle in character and easily overlooked by us humans, but nonetheless very real and important. As you may be aware, I have and continue to dedicate a large portion of my time and efforts to restoring justice for the wild horses and wild burros in the wild, and am advocating for a new approach to our nation’s protective program for them. This “Reserve Design” approach obeys the true intent of the WFHBA in its Section 3 (a), which mandates the BLM and US Forest Service to protect and manage wild horses and burros so as “to achieve and maintain a thriving natural ecological balance on the public lands” and “at the minimum feasible level.” The Reserve Design approach would also insure that these wild equids truly be considered and treated “as an integral part of the natural system of public lands,” as stipulated in the WFHBA initial words. I would like to inform you that I have been doing ecological evaluations with a mind to recommending specifically tailored Reserve Design strategies in several of the legal areas on BLM and USFS lands during the past few years and am attaching for your perusal some of my findings and recommendations concerning these herds and their legal areas. Please feel free to contact me regarding these herds and what can be done to restore justice and a safe future for them. Some of these reports, I have already submitted to various BLM offices. I urge that you as responsible citizens serving on this board represent all citizens of the United States, for America’s wild horses and wild burros are a great and widespread General Public interest that concerns our Quality of Life. And so I further urge you to stand up and recognize the many positive contributions that wild horses and wild burros can and do make in many natural ecosystems where they have a legitimate niche to fill and role to play. These contributions include the building of more nutrient-rich and water-retentive soils, the dispersing of more viable seeds of a greater variety of plant species capable of germination, the opening of thick bushlands, frozen waters, frozen crusted-over snowfields that help many other species obtain forage, and the accessing of water sources or the creation of water pools in very dry areas, etc. These are but a few of the many positive contributions by the wild horses and burros that have been proven to benefit a host of other species, both plant and animal. The wild equids greatly enhance their life communities, or ecosystems, when nature is allowed to reestablish its sane equilibrium, rather than being tortured to fit some narrow-minded agenda of arrogant but very ignorant people. In this regard, here is a very important aspect of equid biology that needs to be taken fully into account. As post-gastric digesters, the wild equids provide a much-needed balance on our public land ecosystems, where ruminant herbivores such as cattle, sheep, deer, elk, etc., are overly promoted to the exclusion of the equids. But this lopsidedness utterly ignores the great complement relation that exists between the post-gastric-digesting equids and the pre-gastric-digesting ruminants, as a series of scientific studies clearly reveal. And you should really read R.H.V Bell’s classic 1969 study entitled The use of the herb layer by grazing ungulates in the Serengeti for this reveals how another equid species, the zebra, greatly assists several other ruminant species to survive, and how a very similar complemental relation must have existed in North America, the proven cradle of evolution of the modern horse species, genus, and entire family: Equidae. I have several other references I could share and that are listed in the bibliography of my book. Before closing, I strongly and particularly emphasize the importance of the wild horse and wild burro herds in preventing catastrophic wildfires on our public lands. This is a most serious issue today due to exacerbating Global Climate Change, aka warming; and the wild equids could do a world of protective good for both the natural ecosystems they should be inhabiting as viable populations numbering in the thousands and for humanity itself. They would perform this great ecological and economic service but only if they are allowed to return to the vast ecosystems, particularly in the West, where the can reduce abundant vegetation. Later in the summer or fall, or even in the late spring, this vegetation often dries and converts itself into a tinderbox of fuel that a lightning bolt, or a careless camper’s campfire, or an off-highway-vehicle striking a rock and igniting a dry clump of grass, can easily spark into a very terrible and destructive, gruesome conflagration. This past year has been the hottest on record; and the West has experienced the most serious wildfires of any year on record. We would all do well to heed this year’s, as recent decades’, warning. I therefore strongly recommend that the US government release the many thousands of wild horses and wild burros who have been excessively cleared off the public lands. They should be set free from their holding pens or short and long-term pastures back into the many millions of acres where they have legal right on BLM-USDI and USFS-USDA lands. Also, through cooperative agreements, they could be placed into other areas where they could perform this same fire-prevention and life-saving role on a very large scale. Private, municipal, county, state, military and other agency lands should seriously consider this option, for the wild horses and wild burros are perfect reducers of exuberant vegetation that so often becomes dry and flammable later in the year, and they can access many remote, steep, and rugged areas, where traditional methods of fuel-load abatement are either extremely difficult or prohibitively costly. As species, the horse and the burro should be recognized for their deep North American origins and long-standing evolutionary development, right here in this continent we inhabit. They should be regarded as a restoration of the vital and balancing “equid element” that enriches and enhances our nation and its natural world (see works by MacPhee, Klingel, MacFadden, and others cited in my book The Wild Horse Conspiracy, as well as chapter 1 of my book). Finally, I take this opportunity to implore you not to insist upon the “killing” option that your board had earlier voted to approve in September, 2016, in Elko. This would be horribly cruel and insensitive and entirely unnecessary and unwise, given the many benign roles that wild horses and burros can play and contributions they can make to the public lands and other ecosystems in our great nation. If the wise Reserve Design strategy that I described for you a year ago in my written input would be employed, America’s precious wild horse and wild burro herds could be restored at genetically viable levels and allowed to harmoniously adapt to each specific ecosystem they inhabit through the sound workings of natural selection. Then with proper containment of a complete viable habitat for each viable wild equid population, we would see each such herd come to naturally self-regulate its population numbers through both extrinsic and intrinsic biological and ecological factors. This is possible but is up to us humans. We must choose which route to follow. Let’s us dare to overcome backward ways of life by going with this very benign and enlightened way of relating to and sharing with these very loyal companions and cohabitants upon Planet Earth, who have done so very much for us humans. Now, isn’t it high time that we do something truly good for them? The main question is: Is there ANY way that this board will read Mr. Downer’s letter, much less comprehend what he is saying & believe it. Really good letter, Craig! I hope that you are right. Craig. Such a wonderful letter! I hope it won’t end up just being throwing pearls before swine. My regard is not high for these ignorant, cruel and selfish people who are supposed to be taking care of our public lands, including our wild horses. Thank you so much for all you have done and will continue to do moving forward. Please keep us posted, and be sure to let us know if we can do anything to help you help our horses. Brilliant Exhortation: Craig Downer’s letter illuminates the way to transform the Wild Horse and Burro Program. Our challenge is to free the Board and our elected officials from their misplaced trust in BLM’s false narrative — the concocted crisis of “overpopulation.” Until the fictitious figures were exposed, BLM controlled that narrative, playing politics to secure a bigger budget. The wild horses were used as pawns and held hostage for budgetary ransom. BLM’s lies and malfeasance went on for too long. But now, the jig is up. The deceitful narrative is unraveling as the truth is revealed. The overpopulation hustle shall stop. Well written. I hope they listen. Thanks so much for all of your support most of all for the horses’ right to be themselves and to have their legitimate place in the wonderful world of nature! We must persist in this the horses and their world — which is also our world — are depending upon our continuing to rise to the occasion! So did the Board listen? What was their response/feedback? Thanks for standing up for the mustangs!! Thank you, never give up!